An in-depth look at the start-up travel companies bringing new passion and creativity to group tours, by Roddy Walsh. In the third of a series of articles profiling start-up, specialist adventure travel companies whose tours are featured on Frontiers of Travel, and in conjunction with Black Frog Publishing's Spotlight series, we look at Overlanding West Africa who run trailblazing overland trips through remotest West Africa, as raw and exciting as adventure travel gets! Overlanding West Africa (OWA) was started in 2010 by experienced overlanders David Oades (Dave The Hat) and Jimmy Corrigan (Jimmy C) in 2010 who have sinced been joined by Al Goodridge. In 2012 they began their pioneering trips in remote and wild West Africa, travelling from Dakar to Accra and back each season on a number of distinct tours. OWA deliberately travel at a slower pace though these rarely visited countries, to get to the heart of the stunning landscapes and fascinating cultures of the region. 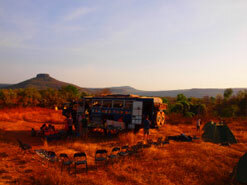 Long before the security situation in Mali forced other overlanding companies along the coastal route of West Africa, OWA were trailblazing new routes, becoming the first commercial truck-based overland company to run trips through Guinea Bissau and Sierra Leone in 2012 and the first through Liberia in 2013. At a time when overlanding through other parts of Africa has become almost commonplace, this is the raw adventure and excitement of overland travel as it used to be! Recently Dave spoke to Andy and Kirsty at Black Frog Publishing about why they set up Overlanding West Africa and why the region is such a special adventure travel destination. Why did you set up Overlanding West Africa? I remember leading a trip from the UK to Cameroon and back, and meeting other travellers on the way who talked about their trips through Guinea, Sierra Leone and Liberia, countries which at that time were considered somewhat risky to travel in. I got the Michelin map out and realised there was this corner of Africa that was completely off the radar for the overland operators. I did some research, and found virtually nobody to date had ever run multi-country trips through this part of West Africa. I wanted to change that. My passion for the region was increasing every year. I knew it was a part of the world I loved more than any other and would love to open up the overland routes on offer there. Another reason was to challenge the common misconception that the west of Africa is dangerous to travel in. For decades the mainstream media has only focused upon the negative, and continually portrayed the region as war-torn, poverty-stricken, and dangerous. That image has become deeply entrenched in the psyche of the majority of people, something which the mainstream media is mostly responsible for. But hey, parts of North Africa and south and east Africa have had the same issues in the past right? Reading between the lines of travel advisories I came to the conclusion that a trip could be devised to connect the countries along the coast of West Africa. Let�s remember, Rwanda, Kenya, Zimbabwe, and Uganda have all gone through some awful periods in recent times, yet tourists still flock there. So why not the same for Sierra Leone, Guinea, Ivory Coast, and Guinea Bissau? Why did you choose to concentrate on West Africa? After working in the overland industry for 5 years, I noticed that some parts of the world had become saturated with overland trucks running the same itineraries to the same places week in week out. Staying in a campsite with other overland trucks was never my idea of fun, I wanted to do the job to get away from the tourist trail and get as far off the beaten track as possible. Much of West Africa has never been on the tourist radar, making for a great opportunity to run a more traditional style of overland trip. West Africa is a region of the world where you can interact with communities quite unaccustomed to seeing foreign travellers, with lots of exciting things to see and do that aren�t written about in guide books (mainly because there are hardly any guide books!). The region is famed for some of the best music in the world, some of the liveliest and most colourful of markets, and some of the most beautiful and unspoiled beaches anywhere on this planet. There are waterfalls, lush tropical landscapes, traditional architecture, wildlife, and a people with some of the richest and most vibrant cultures in the world. It�s a must see region for anybody who wants a real adventure! Why should people travel with Overlanding West Africa? 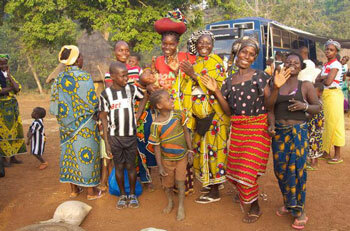 We run trips in West Africa and nowhere else. 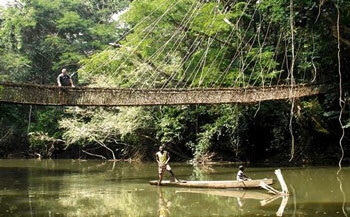 We were the first overland company to run multi-country trips through West Africa connecting Senegal to Ghana via the coast, being the first to go through Guinea Bissau and Sierra Leone. 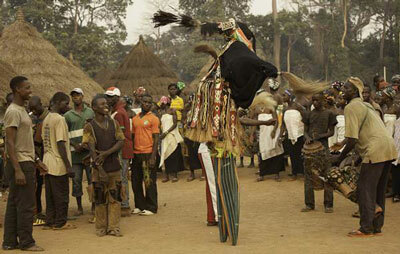 We have the in-depth knowledge on the region to operate the best trips on offer. We know all the best places and have the necessary contacts to make a great trip. 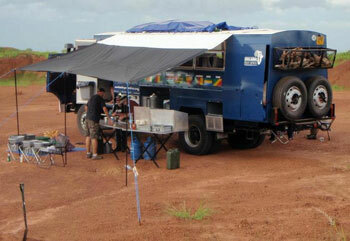 We will be the first truck based overlanding company to go through Liberia in 2013. We take our time to travel through each country, and don�t rush through the region en route for Cape Town like a number of other operators do. 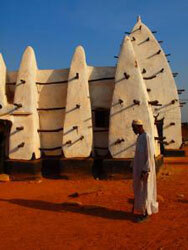 We don�t treat West Africa as an add-on to a bigger Trans Africa tour, we treat it as an incredible region in its own right and strive to highlight the many great things there are to see and do. We go off the beaten track to find all the exciting stuff hidden away down dirt roads, allowing time for passengers to go off and explore. 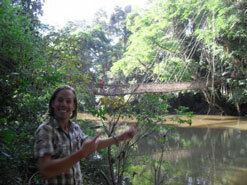 Our trips are much longer than any other being offered allowing more time to see as much as possible. In addition, we only have one truck on the road. All our time and effort is dedicated to that seasons trips. We are not side-tracked with running trips elsewhere. We are a small independent operator with a team who are passionate and enthusiastic about the region. 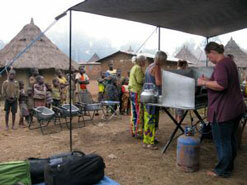 To read more from Dave about Overlanding West Africa and life on the road, check out Black Frog's Spotlight Blog. If you're interested in jumping aboard Aminah and exploring wild West Africa, see more details about these trips on their website. The videos above give a flavour of what it's like to travel with Overlanding West Africa and were made by Jamie Noel, a professional film maker, who joined their Accra to Freetown trip in January 2013. See the OWA video page for more stunning videos. Check our Tour Search page for a huge selection of small group tours from the world's most innovative travel companies. If you run a start-up travel company running adventurous group tours and would like your trips featured on Frontiers of Travel, please contact us. Profiling Infinite Adventures, who run overlanding trips though Alaska and the American West in a remodelled school bus. Profiling Untamed Borders who explore the ultimate travel frontiers like Afghanistan, Pakistan and the Russian Caucasus.